Peterhof is a German word which means ‘Peter’s courtyard’. For the first time Peterhof was mentioned in the Travel Diary of Peter the Great in 1705. It was a place where he could have rest on his way to the island Kotlyn. On the island Peter I began construction works of the fortress that could protect the newly built city – St. Petersburg. It was the time of the Northern war between Russian and Sweden for the access to the Baltic See. The idea of founding such a residence came to him after his journey to France. He was impressed by Versaille and decided to build Summer Residence for himself and his family. But he did not plan to make a copy of Versaille. It was built on the shore of the see and it glorified victory of Russian over Sweden. The construction works on the Upper Chambers began in 1714. At the time of Peter the Great the palace had quite a modest exterior. It seemed too plain to be the Royal Residence. And at the Elizabeth’s time the Palace was reconstructed by the Architect Francesco Bartolomeo Rastrelli. He left the central part of the Upper Chambers (as it was a memorial Palace where Peter I lived) and enlarged the Palace. The Palace was decorated in Baroque style like all the palaces built by Rastrelli at the time of Elizabeth I. Rastrelli created a beautiful line of rooms running from one end of the Palace to another. In 1762 Catherine the Great ascended the throne and fashions changed. The early classical style replaced the luxurious baroque. Some interiors were redecorated in classical style by new architect Yuriy Felten. During the reign of Nikolas I last changed in the Palace were made by Stakensneider, the master of eclectical (historical) style. The Grand Peterhof Palace became a museum in 1918 after Communist Revolution. When Ward War II began the curators of the museum started evacuation works. The half of art items were evacuated to Siberia: some of them (e.g. chandeliers) were hidden in the basement of St. Isaac’s Cathedral. During the war the Palace suffered a lot as Peterhof was occupied by Nazis. By 1958 the restauration of facades of the Palace was finished and in 1964 the first four rooms were opened. Nowadays Peterhof Grand Palace attracts a lot of visitors from all over the world. They come to visit not only the beautiful Palace but also to enjoy the Lower park of Peterhof that is famous for its numerous fountains. 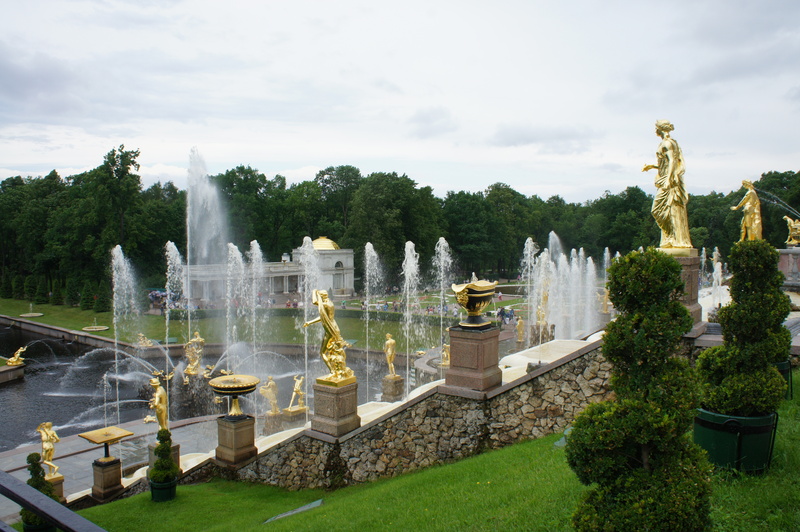 Do not forget to include the visit of Peterhof to your itinerary.